The Indian Army of 1914 marched into battle on the Western Front with a long history of service and representing a wide range of proud Indian regiments, and all the social and religious backgrounds in the India of that period. This image from a French source shows “Hindoo troops” (a common phrase they use for all Indians) and was part of a series of postcards produced in 1914 as the French were equally as fascinated with the arrival of Indian Army Troops in France, as Britain was in her own homeland. 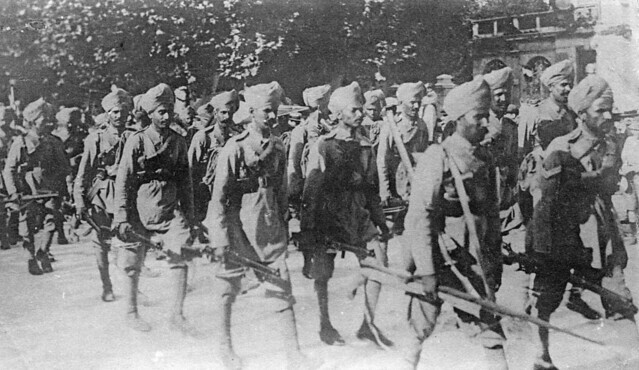 What it does show is that when the men of the Indian Corps began to assemble in France in 1914, they had come straight from India wearing their thin Khaki Drill uniforms. These were fit for purpose in the hot climates of India but would prove unsuitable for a European autumn and winter, resulting in large numbers of Indian casualties from sickness. Within a few weeks of this photograph being taken these men were in action during the First Battle of Ypres. This entry was posted on 11/09/2012 by sommecourt. It was filed under France, Great War, Indian Army, Western Front, WW1 and was tagged with 1914, Hindu, Indian Army, Khaki, Ypres. A lot of people think because they are wearing a turban they are sikh, but many hindu soliders wore turbans and turban is also an ancient hindu garment even worn by Rajasthanis today. Thanks for those additional details, they are most welcome. Nice photo, I have a few myself including one of Indian troops heading for the front in a London bus.